I have finished piecing together the Nine-Patch Quilt top and it came together without any problems. Finished quilt top measures 42.5" x 54.5"
I made a total of 63 blocks, 32 of which are nine-patch blocks. The finished size of each block is 6 inches. Of course, I also pieced the quilt backing. 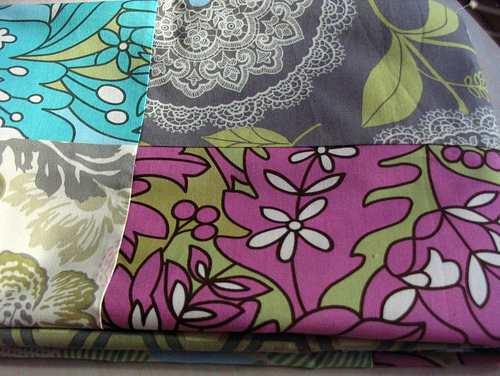 It is made from more pieces of Amy Butler's latest fabric ranges ~ Daisy Chain and Midwest Modern. The quilt is basted and ready for quilting. I am looking forward to endless rows of stitching, passing time as I count down towards this week's main event: The Craft and Quilt Fair in Melbourne!! This looks GREAT and I can't wait to get started on my new one. I love how it looks without sashing and yet it still has white in it and makes the 9 patches POP!!!!! LOVE, LOVE, LOVE it!!! :) Have fun this weekend. I really like the twist you did with your quilt. It looks fabulous. Would you mind if I borrowed your idea for a baby quilt for donation? Absolutely beautiful! Love the setting. It really enhances the blocks. Gorgeous quilt - love what you do. Hope you enjoy the show. What a great quilt. I love the simplicity of the nine patches and the colors are splendid.Have fun in Melbourne. I wish I was there. Please take pictures too! Thanks. Your work is lovely. Thanks so much for sharing pictures with us. what a great solution!! i always liked how your blocks had a white center and this setting really works. This looks terrific. I think so often we forget the power of white--of "negative space" in our designs. I think that your design shows off the bold prints well, in giving them room to breathe. Just amazing Rita! 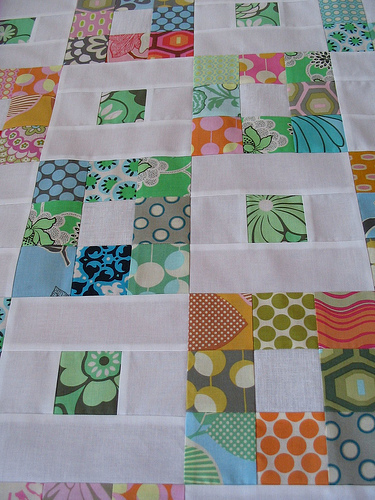 I lvoe the white blocks, it freshens up the entire quilt! Hope to see you Thursday! Beautiful as usual! 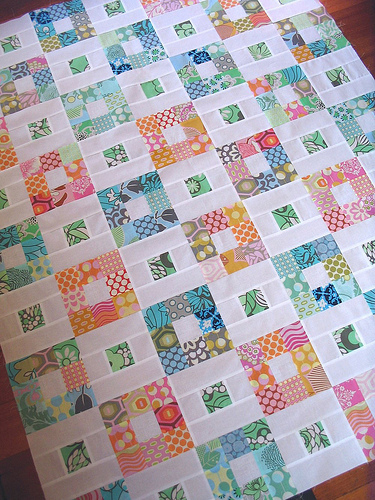 I think what I like most about this quilt is the little coloured square you've put in the white boxes. They balance it beautifully. It's verry FRESH, I like it! Oh, gorgeous! I love the positive/negative space thing you have going on. And the white makes it look so fresh and light, in spite of the richness of the colours. So lovely! Thanks for the inspiration as I get ready for a day at the office... THEN home to work on my Amy Butler quilt :-) Well done as always Rita! I have been quilting since Oct 2008 and I thought I have done alot of quilts. I have following you from I think 3 weeks and look at all your work love all that you have done. You have the style of quilts that I loike to do. And it makes me sad that I can't do them as fast as you can. But thanks for sharing all your lovely work with us. What would I do now if I can't see what you have done. That's bright, but not too bright. Looks great. That looks great! The white patches bring it to life. This may be my most fave yet! Beautiful! What a good idea for the blocks. I can't wait to see the quilting. Love the centers surrounded by white. I really need to get moving on mine. Oh wow!! This is outstanding! Where can I get the fabric requirements?